At the end of September I got to participate in a really amazing event called the Big Fake Wedding. The event is a fresh take on a bridal show built around the idea of showcasing wedding vendors doing what they do best -- putting on an amazing wedding event for a real couple. The night features a ceremony of vow renewals for a couple and then a huge party reception. The "wedding guests" are brides and grooms to be! The event featured invitation and paper goods designers, like me, photographers, florists, clothing and jewelry providers, caterers, DJs, live bands, photographers, and videographers. Everyone together did what they do best and put on a truly amazing event! 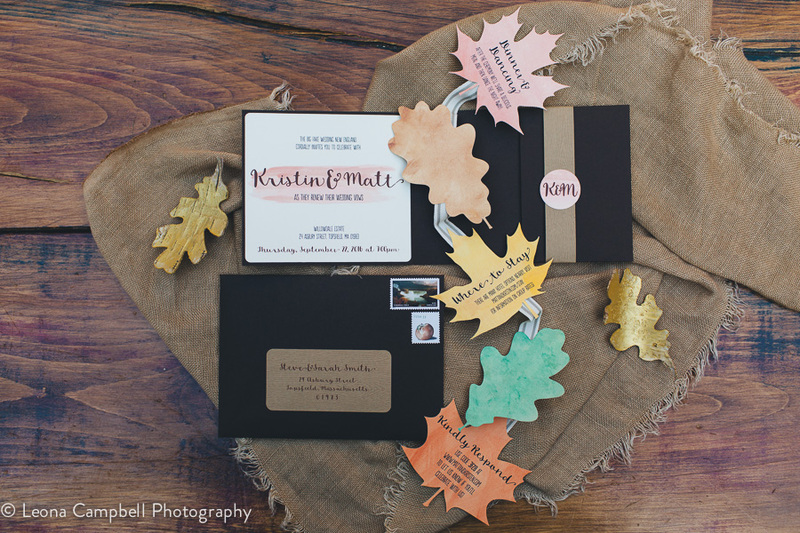 As you may have picked up in my wedding invitations and what comes next series, there are a lot of paper goods to consider for your wedding! For the Big Fake Wedding, I designed a full invitation set, as well as guest favor boxes, dinner menus, and table numbers. It was really fun to design for the the "Autumn Harvest" theme--it happened to tie together my favorite season and some of my favorite colors, so I basically took this as an opportunity to design my dream wedding invitations. You might be aware that most of my work is actually in designing and creating unique papercraft kits. I LOVE to make paper do unexpected things, so I took this opportunity to think outside of the box a little! When you pull the invitation out of the envelope, you see a standard pocket enclosure, with the primary invitation text adhered to the flap where you would expect. When you reach into the pocket to pull out the traditional assortment of cards that tell you how to RSVP and which hotel to stay in, you realize that they aren't cards at all! I created a garland of watercolored paper leaves that contains all of the important information, and can serve as a seasonal decoration (and reminder of the wedding), or at least a worthy commemoration of one of the most important days of your life! I worked with Jody at My Personal Florist to create the custom die-cut menus and 3D table number for table #4. I created a more rustic/romantic menu and table number design for Jenna's (O'Malley Floral) impressive (and giant!) arrangement for table #8, and we set each seat at the table with a menu held in place by a wine cork stand, and an elegant favor box crafted out of the same textured paper. And photos! The watermarked photos above were all shot by photographers who participated in the event. One of the fun parts of the day was that the vendors were all there for several hours before the event, setting up and getting to know each other. It was really lovely to get to know these talented professionals! Most of the photos above were taken by Leona Campbell, including the beautiful shot of my invitation design at the top of the page. There's also some that were taken by Danny Ebersole, from Ebersole Photography. The Big Fake Wedding was a unique and creative event and an amazing way to get a real feel for all the elements that make your wedding day so special. If you're getting married soon and feeling overwhelmed with imagining your special day, I'd definitely recommend checking out a Big Fake Wedding event near you! I'd be happy to talk more with you, too, if you're needing custom invitations or paper goods for your upcoming wedding or big event. Learn more, see more examples of unique invitations I've designed for and with other couples and get in touch by visiting my wedding invitation design portfolio! Get inspired by more photos from the Big Fake Wedding, or learn more about the vendors who participated in the event.